I’ve had some people ask me how I managed to finish 60 classes in 60 days. Admittedly, it was a stretch. I devoted a LOT of time to this challenge. I basically spent 90 hours in the studio over a two month span of time. That’s craziness. Researchers differ on habit forming behaviors, but 60 days is often touted as the magic number for forming a new habit. That’s one of the reasons why I’m continuing on to do 90. I’m that paranoid that my body will get lazy again. Yes, I took it old school and had a calendar with stickers. You can see that I whited out a few days here and there. What I find interesting is how I really gained momentum in the second month. Remember that my first day at the studio was February 13. I went into this challenge with basically 2 months and 38 classes under my belt. I think that is part of the reason why I was able to do this. A lot of people start a challenge in their second month of practice and they get burned out really quickly. I chose to ease myself into it and that helped me in the long run. I like calendarsthatwork.com for making my schedules. They have a free template section, which I use for all of my tracking purposes (exercise and for classes I’m teaching). Then, I headed out to the craft store to pick up some stickers and taped it on my wall. I front load the schedule with the classes that I plan to attend. After the class, I cover up the class number with the sticker. If I got behind, I would pencil in a new number and move ahead. This helped me to keep track of where I was at in the 60 days and also motivated me if I slacked and went to one class and not another. 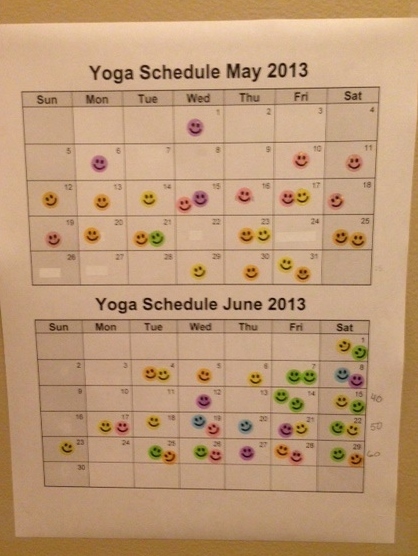 Besides, who doesn’t love smiley face stickers??? I’ve already created a calendar for July. My projected end date is the 26th for my 90th class. Life happens, but I hope I can get there on that day. Tell as many people as possible that I’m doing this challenge. This made it real, so I couldn’t bail out. Blogging about it kept me accountable. Studio allowing me to start putting up my stickers early. Just another layer of stickers, but it was fun. Stopped apologizing for going to class instead of doing something else. Realized that this was time well spent on me. Realized that not everyone would understand the rigor of being in a Bikram class, so they wouldn’t understand why I was hyper-planning and crazed with what I put in my mouth, drank, or whatever. When I stopped trying to justify myself, I was a lot less crazy. Prepare things for class in advance. I have outfits laid out three classes in advance, complete with underwear, headband, and towels. I just pick up the pile, pack it, and go. I try to have one rolled up mat in my car at all times. Prepare food items in advance. I juice at night a lot and bottle up stuff for the next day. That way, I just grab and go. I’ve really gotten into eating Kind bars in the afternoon before class. They are great for me because they are gluten and dairy free. I also have cold waters and coconut water on a special shelf in the fridge, which stays stocked so I can have those at my fingertips. Purchased another pair of yoga shorts. I have three pairs now but it would be nice to have another since there always seemed to be a pair hanging out to dry when I was running a double class on consecutive days. Putting lotion on my feet at night. Although my skin is super soft, my poor feet are just so torn up on my heels and the balls of my feet. Slacking off early in the month. I basically pulled two weeks where I did 10 classes a week to make up for it and that was tiring. I need to go into the studio when I don’t feel like it. Get a new pair of shorts. I am eyeing a side tie short. Still no time to sew my own. Eat cherries. I love cherries! They are great this time of year and are super high in anti-inflammatory goodness. Stick to my schedule as much as possible. Do split doubles on Monday and Wednesday as much as possible, rather than back to back doubles. Focus on a posture and try to make it happen to the fullest expression each week. I’ve been working on floor bow pose but I’m also trying to get my balance improved on the one leg standing postures. Take salt baths. Although I didn’t experience the muscle soreness in the last 60 days like I’d anticipated, I do feel pretty worn out and maybe a salt bath would help, even if it’s once a week. Make a new friend at the studio. I found immense support from a couple of people at the studio that I befriended early in May. I need to learn more people’s names and support someone who is trying to do a personal challenge on his or her own. Ask for more direction after class. Let the instructors know what I’m struggling with so they can watch for that in class and give me appropriate corrections. Try to get in the zone faster in class. Just focus on the dialogue and let the day go.